If you are a regular casino poker player, you might think playing more than one table is impossible, and you would be almost right! Until the advent of online poker that is (where you can play up to 24 tables at a time). The reason to play more than one table is simple: you take a small hit on your win rate per table for an increase in the number of hands you can play. This should increase your hourly winrate. 1) Teach you everything there is to know about multi-tabling and give you the basics of an MTT strategy guide. 2) Provide you with information so you can play more tables (poker tournament strategy tips). 3) Answer the question of how many tables you should be playing. Multi Table Poker Software: Table Optimizer (make your life even easier!). Your Goal: Profit or Improvement? So, How Many Tables Should You Play? Multi-tabling is not a new online poker strategy and has even allowed some players make a living at some low limits such at 50nl. Some player can even make a decent wage multi-tabling the micro-stakes games (10-25nl). I was fortunate enough to be able to pay my way through university by multi-tabling on PokerStars. I played mostly at 50nl and 100nlz zoom (fast table variant), and so I have a lot to thank for the ability to multi-table online. Doubling the number of tables will 2x the number of hands per hour you will play- great! But, due to reduced focus and decision time for each table, your win rate (bb/100) will decrease. For experienced poker players, the reduction in win rate will be small for each table added up until 8-12 tables. This is because the majority of the decisions an experienced player makes are automatic. Little thought it required. Hence, little time is needed for each decision, and decision making can be scaled up to more tables and hands. As you increase the number of tables further, you will see a more rapid drop-off in win rate. But even then, are we at the optimal number of tables to maximise profit? Maybe we should continue to add tables until we begin mis-clicking or timing out? Limit the development of your game. A game which is not developing is going backwards compared to the players around you. According to the above list, there are more drawbacks than there are benefits. But there are only more drawbacks if you don’t use the correct multi-tabling strategy. Multi-tabling is a very profitable strategy when employed correctly. Thus in this article, we will turn you into a multi-tabling pro by making sure you multi-table the right way, and avoid the common pitfalls. 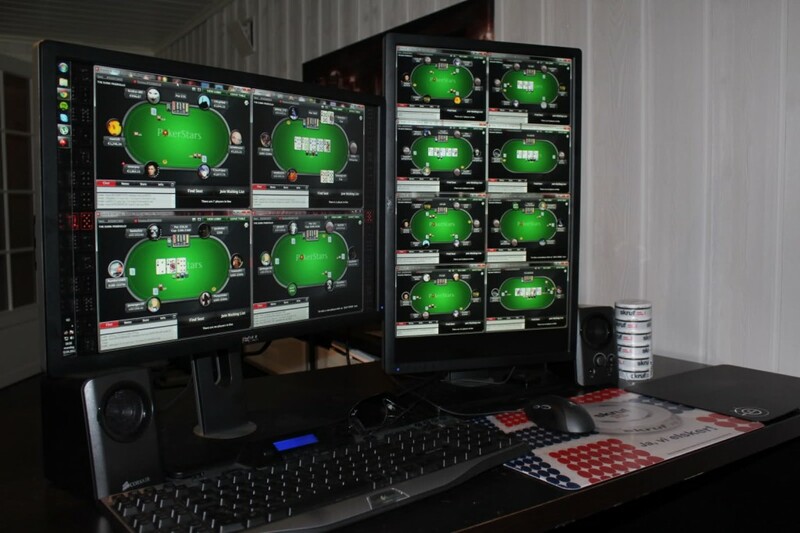 Keep reading for the top 10 tips for multi-tabling near the end of the article. The law of diminishing returns is in action when selecting the number of tables to play. When you are seated at one table, your win rate will be maximised, and you will be more likely to play your A game. This is assuming you are not bored or tilting of course. As you add more tables you should see an increase in your hourly rate, but a decrease in overall winrate. If you earn $10 per hour playing 1 table, that will be $10 per table and $10 per hour; simple. 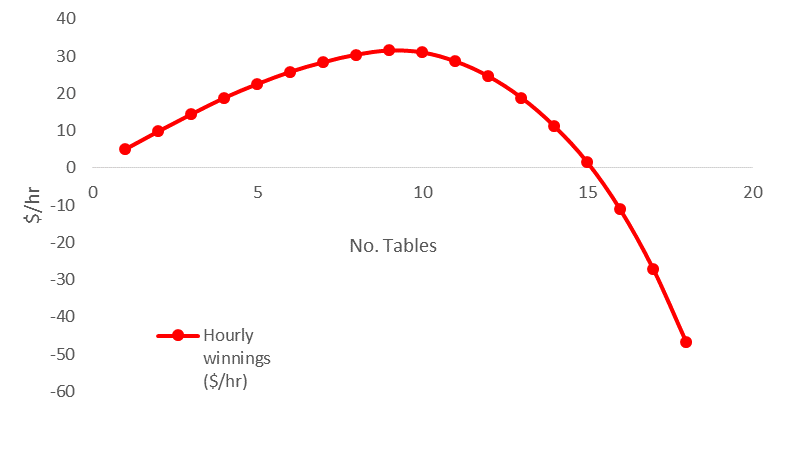 If you earn $19 per hour playing two tables, your hourly has increased, but your overall win rate has dropped. Thus it will be $9.5 per table. If you play ten tables at $5 per hour per table, you will be earning $50 an hour. Making more money sounds easy, right? Increase the number of tables further and will again see a drop off in your winrate and may see an increase in your hourly, but only to a certain point. When analysing the number of tables you are playing, it is also important to understand how much you value your time – for more info on his see this article by SplitSuit. Imagine that for each table we add our table win rate drops by $0.1 per table for the first four tables. Then doubles to $0.2 for the next and so on. When we play a small number of tables (e.g. 1-5 tables), the drop in winrate will not be significant. But with more tables (12-18 tables), the drop in win rate will be much larger. Although the model of this is based on simple math, it still allows us to illustrate a point. It is clear that there is an optimal table number to play is 9 for a total of $31.50 an hour for this set of parameters. If we increase the number of tables past this our overall hourly rate will drop off significantly. The actual amount a player’s win rate decrease for each table added is impossible to determine. It takes a huge number of hands to approximate your overall winrate and therefore finding the win rate for the number of tables played is practically impossible. The numbers used are educated guesses but do have value as they illustrate a valid point. We can see the inflection point (peak) in the curve: there is an optimal number of tables to play based on the parameters given. Although, this is only considering profits on the poker table. We have yet to discuss the effect of rakeback. Rake is an important consideration when discussing any aspect of poker, but is particularly noteworthy when discussing multi-tabling. Rakeback will generate an almost guaranteed income when playing online poker. If you play 1000 hands, you will be paid a certain amount of cash based on the rakeback rate of the poker room. For example, when playing 100nl zoom, I typically earn around $20 in rakeback for 1000 hands (approx. 1 hour) of play. The key point to consider is that rakeback will scale linearly with the number of tables whereas our regular winnings will not. Rakeback isn’t affected by how well you make decisions – you will make the same whether you play poorly or extremely well. 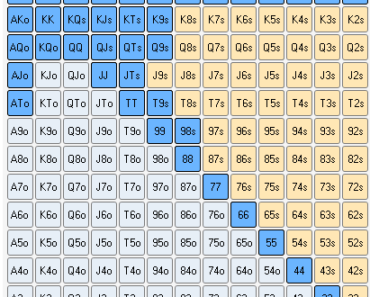 Rakeback can add a considerable amount to our bottom line when multi-tabling. In fact, it is actually how some players make all their profit playing poker (not something I would encourage for variance reasons). Going back to the previous model, we can add rake back into the equation. 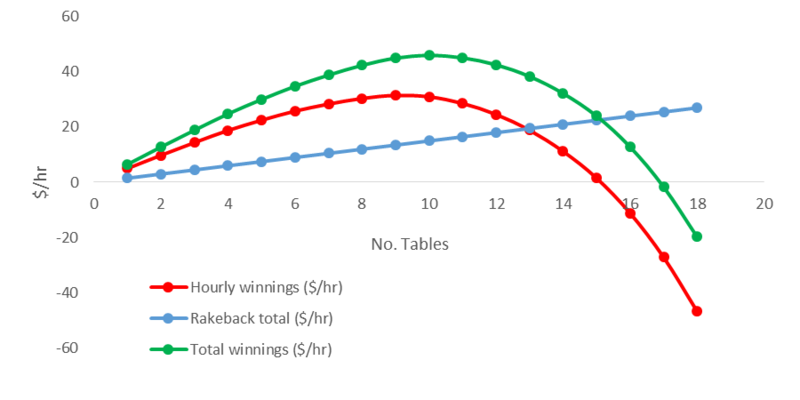 As rakeback will scale linearly with the number of tables we are playing, we may need to adjust our strategy (i.e. how many tables we play). When rakeback is considered the overall winnings increase: we have an another source of income, so this makes sense. But what is important is that rakeback changes the optimal table number from 9 to 10. Although, both ten and eleven tables are more profitable than nine tables for this particular situation. The highest win rate is $45/hr with ten tables. Although the model is based on estimates, it illustrates pretty well what happens on the poker table. Hopefully, you can now see why multi-tabling is so widely employed online. 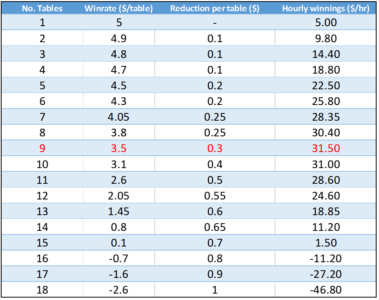 We increased our win rate from $6.50/hr to $45/hr in this example by just increasing the number of tables from 1 to 10. Well, quite simply you should not make any strategy adjustments when playing more than 1 table. If you have a strategy that works when playing 1 table you should keep that using strategy. You should try your best replicate it over more tables to generate as much profit as possible. Often it is said to play ABC (straightforward poker), but that is leaving money on the table. When you play an ABC strategy, you are not going to be fighting back vs. regulars and just playing your hand strength face up. Playing ABC may have worked a few years ago, but every edge you can gain when playing in 2017 must now be pursued. There are no easy wins in today’s poker game. The only difference between playing 1 table and multiple tables is you will not be able to play as many hands. Marginal hands will often be folded out of necessity to save time. That’s not a strategy adjustment; it occurs because of the nature of multi-tabling: some hands will slip through the net. We would like to play the hands, but there is a trade-off happening. Tiling is the simplest form of multi-tabling and the easiest to start out with – especially for a beginner. Tiling is the placement of each of the tables side by side so that you can see each table clearly (like the tiles in your bathroom). Tiling works well up until the point where the tables become too small to see clearly. As you add more tables, the size of each table must reduce. Eventually, you will reach a number where they are too small to see the finer details of the hands (bet size and stack sizes in particular). This method has the advantage that all tables can be seen at the same time. It becomes easier to organise in your mind what actions have occurred in each table because each table has a set position. Stacking is the placement of each table on top of one another. The main benefit of stacking is that you save space. The drawbacks are that is impossible to look at two tables at the same time, and you can miss a lot of action due to the tables being covered. Being only able to see and think about one table at a time is a big hindrance. I have come across some playing who have had success with this layout, but I never had any. It’s hard to keep track of the action since each table doesn’t have a set position on the screen. I use the position of the table to help recall the previous action of the hand. Maybe you might find it different. Cascade is similar to stacking, although each of the corners can be seen from each table. This means that if you need to access a particular table you can click on it to bring it to the front. Cascading has benefits and drawbacks as stacking, although it does take up slightly more space. My favourite method of setting up my tables is using a slight overlap between each table. 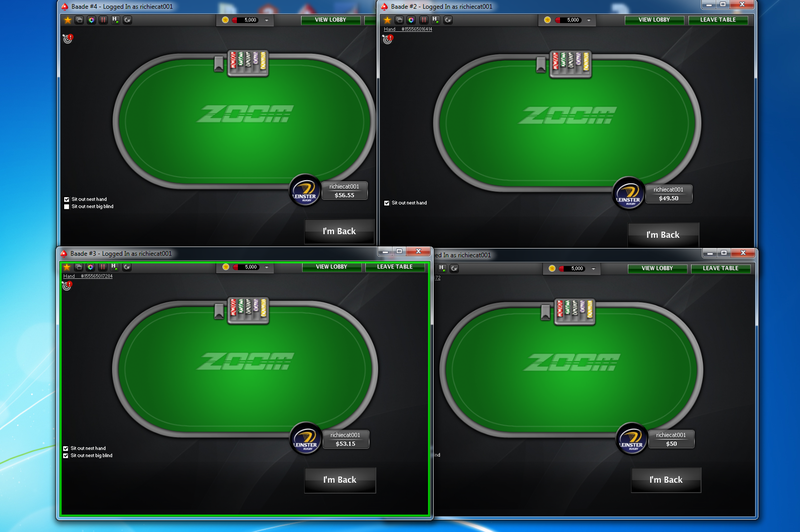 I don’t use it anymore because I play four zoom tables which result in plenty of resolution real estate. However, when I played standard tables, this was my go to layout. Unfortunately, there is no easy way to set it up. You have to resize and place each screen into the right position manually. The main benefit of this layout is that you get the advantages of tiling (seeing and remembering all the action) and saves space at the same time. It allows you to fit more tables onto the same screen than tiling without the drawbacks of stacking or cascading. 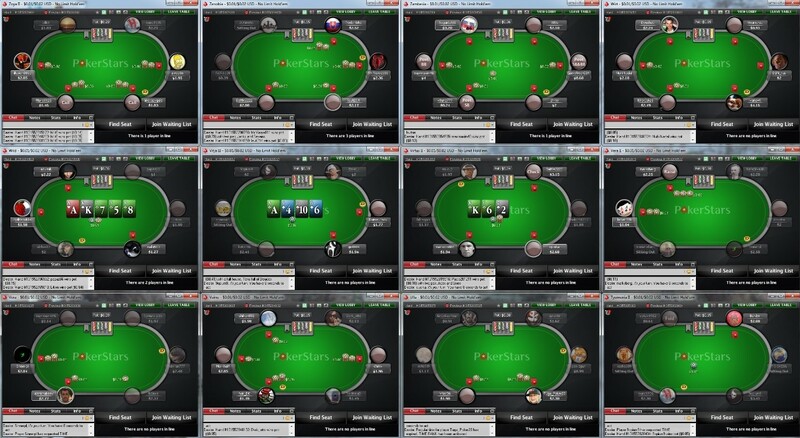 From my experience, PokerStars is the clear winner if you plan to mass table online. 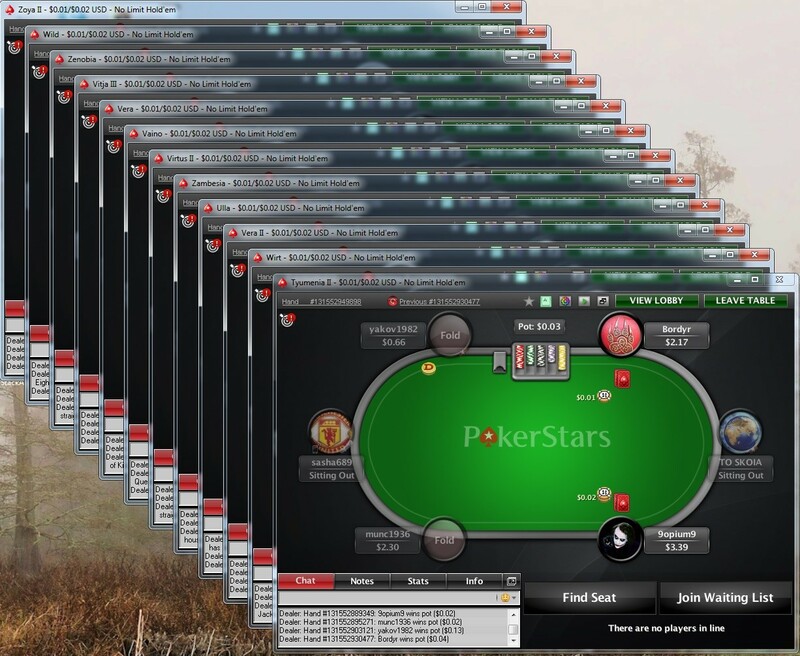 The primary reason PokerStars is great for multi-tabling software is easy to use. The software on other poker rooms can be tilting, especially when you are used to PokerStars. Another advantage of PokerStars is the traffic. There will always be enough tables available whether you play tournaments, sit and goes, or cash games. However, the biggest benefit of playing at PokerStars is the use of hotkeys. As far as I am aware PokerStars are still the only poker room to have hotkeys. This alone makes it worth playing there. The drawback of playing on PokerStars, however, is the poor reward system structure. The difficulty of the games on the site should also be considered. Hotkeys allow you to program buttons on your mouse or keys on your keyboard to do certain pre-set moves. For example, I have two of my mouse buttons set the bet size to a ½ pot and ¾ pot which allows me to find my bet size accurately in a hurry. I also configure the F key to fold my hand, which means I don’t need to use my mouse to click the button. This non-click saves a surprising amount of time when you fold about 700-800 time an hour preflop. If you like, you could set other keys to check and call to increase efficiency further. In the case you don’t want to play on PokerStars (or can’t) you should invest in Table Ninja. It gives all the same functionality of hotkeys but at a cost. There are also some table ninja alternatives such as Table Droid and more are discussed here. Table Optimizer is a handy tool which allows you to modify PokerStars tables to remove title bars and borders. It automatically moves and resizes your tables to the layouts that you pre-set when you add or remove tables. Removing the borders and title eliminates the chance of you closing down or resizing the tables mid-session. This is something I found particularly annoying on Stars. It allows you to change $ amounts for BB. So no longer are you worried about what stakes you are playing or the monetary value of the pot, you know just concentrate on making better decisions. It does what it says on the tin and gives you more space to play with on your screen. You get a 30-day trial so head over to table optimizer website to try it out and find out more. 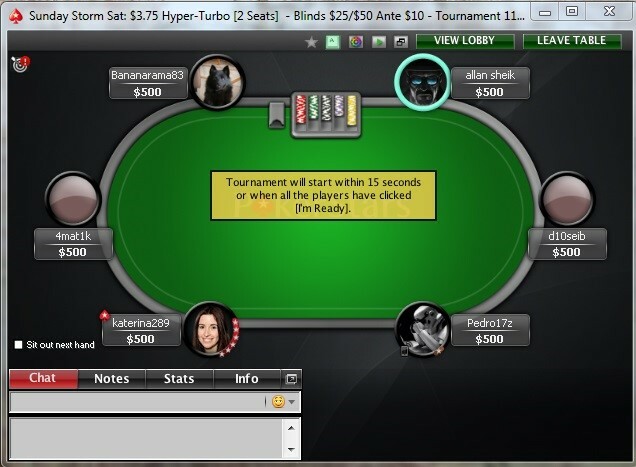 Multi-tabling sit and goes, and tournaments are quite different to multi-tabling with cash games. With a cash game, the structure and thus your strategy never changes. Unfortunately, the same cannot be said for sit and go’s and tournaments. These game types both have a start time, and from there the structure will change (sometimes at different rates). This adds another challenge to multi-tabling as your strategy is now changing depending on what stage of the tournament you are playing. Register for a set number of tournaments, for example, 8 sit and goes. Play out these tournaments until all eight are finished and then register for another set of 8. Continually register for tournaments to maintain your maximum amount of 8. Every time you get knocked out or finish a tournament you start another straight away. The first method is the best to start with as a beginner. Most games are going to be at similar stages while playing. This reduces the complexity of your strategy adjustments. The first method has the drawback that towards the end of the tournaments or you are only playing a few tables at the same time. As a result, you are missing out on potential earnings. However, it is a good place to start. With more experience, you can work towards using the continuous method to improve efficiency. For more information on sit and go strategy check out the article. I would also highly recommend checking out this post by TopPokerValue.com for the top poker sites for sit and goes. Firstly, when you play more tables, your win rate will drop as alluded to at the beginning of the article. This is bad when considering the effect of variance. The higher variance will mean you need a larger bankroll to withstand the swings. You also need a larger bankroll for actually buying into all the tables. If you are employing a 20BI bankroll strategy and you try to buy into 24 tables, it just won’t work. Unfortunately, poker rooms don’t like overdrafts for obvious reasons! When deciding whether to play multiple tables, you must consider what stage you are in your poker development. Multi-tabling works effectively when you are experienced because the majority of the decisions you make are automatic. You don’t need to think about most preflop decisions; you just need to stay focused and concentrate on the game. To take an example, when I am dealt KTo UTG in a 6max game I don’t need to think – it’s an auto fold. When I get QJs I know it’s almost always an open; again I don’t have to think. I know all the hands I will be opening from each position off by heart. This makes me and other experienced players very efficient when multi-tabling. When you are new to poker, you have to think about every decision, so mass multi-tabling doesn’t work very well. The more decisions that come to you without thinking the more you will succeed with and find multi-tabling easier. 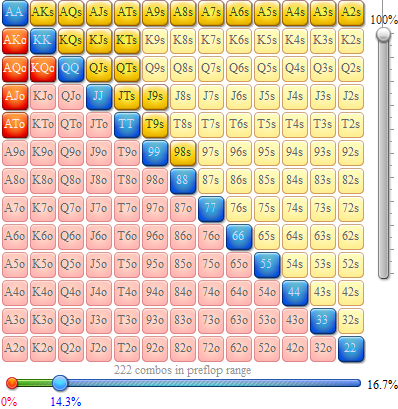 See preflop range construction for more information on how to build and learn ranges. Take that into consideration before opening up ten tables for your first ever online session!! The final consideration you need to make is when multi-tabling is if your primary goal is to make the most profit now? If so you can make a decision only based on your bottom line only. However, if your ultimate goal is to improve your game as quickly as possible (poker training will help with that! ), you need to take steps to make that happen. That typically won’t mean playing as many tables as humanly possible. Often forgotten is future profits. By playing fewer tables, you make better decisions. That means a higher win rate which also implies lower variance. Lower variance results in less tilt and again higher win rates – it’s cyclical. Typically mediocre regulars play too many tables, they make lots of poor decisions because of this, and they tilt very often. This puts a very low ceiling on the stakes they can profitably play and leaves them stuck at the micro limits. Lowering the amounts of tables gives you more of an opportunity to put an opponent on a range and exploit them instead of playing in a standard, robotic manner. Reducing table numbers gives you the opportunity to grow as a player and learn more quickly; thus you are far less likely to plateau at a single limit. Some of you reading this may not be in it for the dream of playing nosebleeds, which is obviously fine. I never was either – I was only ever looking to do something I enjoyed which could earn me some cash and put me through university. But in any case, you need to think what will be more profitable long-term as opposed to most profitable at this very moment. You may earn 2bb/100 playing 20 tables while only 3.5 bb/100 when playing ten tables. Since you will be getting twice as many hands with 20 tables, it may seem clear to play 20 tables if not more. But is that the right long-term decision? Personally, I play four zoom tables. This gives me enough time to thoroughly go through my thought process while giving around 1000 hands per hour. I feel that when I play more tables than this, the quality of my play decreases and I fatigue at a much quicker rate. So I am happy to stick with four zoom tables. Everyone is different but you should listen to your body and mind is telling you and find that sweet spot. But as new players, you may find it difficult to understand what your body and mind are telling you. In that case, it may be better to play too few and make lots of good decisions than play too many tables and make lots of poor decisions. Find out how many tables you can play before making common mistakes such as misclicks and timeouts etc. Then reduce the number by one or two. If your goal is then to make money as much money as possible stick with that number. But, if your goal is to improve as quickly as possible, close another 1 or 2 tables. This will and give your more time to think and exploit your opponent. Play even fewer tables if you want time to think about every decision and exploit your opponents maximally. If you are new to poker and multi-tabling, you should start small. A brand new player should start with just a single table. It is a new experience, and you will still have a lot to learn, so there is no need to play more than 1 table. Basically multi-tabling doesn’t apply to brand new players. If you are relatively new to poker and ready to give multi-tabling a make sure you start slow. Walk before you run. Add a single table and see how you perform. If you feel like you can handle it add one more then next session. Don’t rush it. Make sure you take breaks: multi-tabling is very difficult and tiring. I try to take a 5-minute break every hour and 30-minute break every 2-3 hours. You need time to rest and recover; you can’t just work a full day then go multi-table for 6 hours straight. You will burn out. Prioritise your decisions – For example, if are dealt AA on one table MAKE SURE YOU DO NOT TIME OUT!!! Sorry about the shouting but it has happened too many times. Improve your focus with focus drills and session warm-ups. Blackrain’s post on playing solid poker is also a good place to start. Adjust the number of tables based on the level of focus that particular day. If you don’t feel right (maybe your tired or stressed) don’t open up your standard amount of tables. Drop a few off and allow yourself more time to think. Your bankroll will thank you. Table selection is still very important. Just because you are multi-tabling doesn’t mean you should forget about table selection. You should still be on the lookout for good tables and sit out of bad tables. See this article for good table selection information. Make sure you are comfortable. If you are going to be sitting at a desk for hours upon hours invest in a comfortable chair. Nothing fancy or expensive, just something that suits your comfort. Check this article out for top 5 poker chairs. Purchase a reliable computer. Something that will have no problem running Poker Tracker and the poker software will do fine. 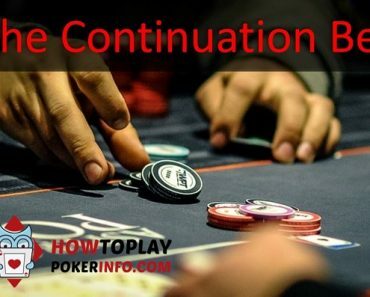 Have a read of this article on computers for poker for more information. Get a reliable mouse and keyboard. There is nothing more frustrating than a buggy non-responsive mouse. Stay away from rechargeable mice. Running out of charge midway through a massive pot is asking for a broken mouse/screen/hand. 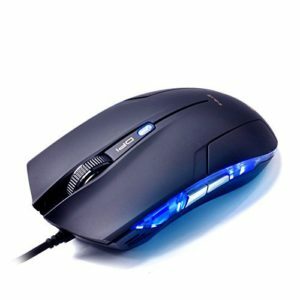 Here is the mouse at Amazon I use which is cheap and good quality. Along with your computer, if you plan to mass table you will need a good monitor. Fitting all your tables onto a small laptop screen will not be possible so I would recommend getting a monitor with high resolution. See this guide by FirstTimePokerPlayer.com for more information. Instant access to the last 5 more Texas Holdem Multitabling tips below by signing in. Thank you for the support! Only play one game type. Playing one game type when multi-tabling is already difficult. Don’t make life more complicated by playing multiple game types. If you begin mis-clicking or timing out drop off some tables. You are probably becoming tired and playing a couple of fewer tables will be a good choice. If you are constantly mis-clicking and timing out, you need to drop the number of tables permanently. Avoid distractions. This might mean putting a block on Facebook twitter etc. The very last thing you should be doing is playing 10+ tables with Facebook open. Turn off chat feature. The chat feature is just a distraction and a way for your opponents to put you off your game. Don’t lose focus when someone writes a spammy comment- just turn it off. Pay attention to avatars. Avatars are the little icons over people’s names which give a little personal touch to the poker room. Some have said that these are a distraction and should be turned off, but I feel they help me recognise players. This allows me to remember strategic adjustments I have to make for each player. I will leave this one up to you. Ultimately choosing the right number of tables to play is a balance between win rate, quality of decisions and poker development. Forget the last two points at your peril. It would be awesome if we could increase the number of tables but keep the same win rate, but unfortunately, it doesn’t work like that. Our concentration and focus are limited; so playing 24+ tables won’t work for everybody. Take all the factors discussed into account, decide on your ultimate goal (profit vs. learning), and choose the number of tables most suitable for you. Any thoughts or comments on multi-tabling? How is multi-tabling going for you? Let us know below.